© 2000 − All right reserved. 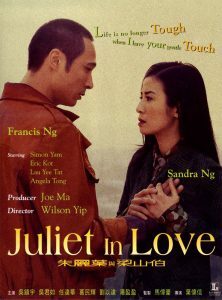 Francis Ng is Jordan, a low level triad who finds himself strangely attracted to divorced restaurant hostess Juliet (Sandra Ng), who’s had a mastectomy and has since retreated into a shell. Through coincidence, the two form a makeshift family with the child of a triad boss (Simon Yam) who’s after Jordan for some dough. An offbeat romance between two social misfits starring Hong Kong’s most accomplished actors, Sandra Ng and Francis Ng, in the leading roles. The film marks a new confidence in Wilson Yip’s directorial career, taking his cinematographic and genre experimentation one step further in his first love story. Jordon is a third-rate gangster in Kowloon who isn’t cruel enough to progress far in the underworld; plain thirtysomething Judy has been abandoned by her husband and lives alone with her senile father. They meet when Jordon tries to jump the queue at Judy’s restaurant and again when both are at a moment of crisis: Judy’s father is injured in a traffic accident and Jordon is desperately settling a friend’s debt. After taking her to the hospital, Jordon gets an unusual offer from local triad boss Cheng: he’ll clear the debt if Jordon and Judy babysit his illegitimate child for a week. Wilson Yip layers Matt Chow’s nuanced script with wildly inventive cinematography and a chameleon-like score that shows a new confidence in his directing. While Hong Kong cinema has always taken a lead in innovative camera and editing techniques, here the colour processing, switches in camera speed and roving camera – literally getting inside our characters’ heads – propel the story forward into new territories. Yip once again proves his skill at handling actors, albeit working with a standout cast of Hong Kong’s finest in both leading and supporting roles.